Lockout/Tagout Training - This 2-hour program applies to all persons engaged in servicing and maintaining machines and equipment that might energize or start-up unexpectedly. Meets the requirements of 29 CFR 1910.147. The recognition of applicable hazardous energy sources, the type and magnitude of the energy available in the workplace, and the methods and means necessary to isolate and control energy sources. The purpose and use of the energy control procedure. 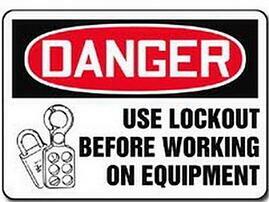 Prohibitions relating to attempts to restart or reenergize machines or equipment that are locked out or tagged out. When Tagout systems are used, participants will also be trained in the application and limitations of tags.